Bring water to a boil and cook pasta. In the meantime, cut a cantaloupe into matchsticks to mimic the shape of the pasta. Break the prosciutto apart into smaller pieces with your hands. Mix the cantaloupe with the oil, vinegar, and marjoram. When the pasta is ready strain it, give it a slight rinse to cool it down a little, then toss it with the cantaloupe. Mix in the prosciutto and serve. 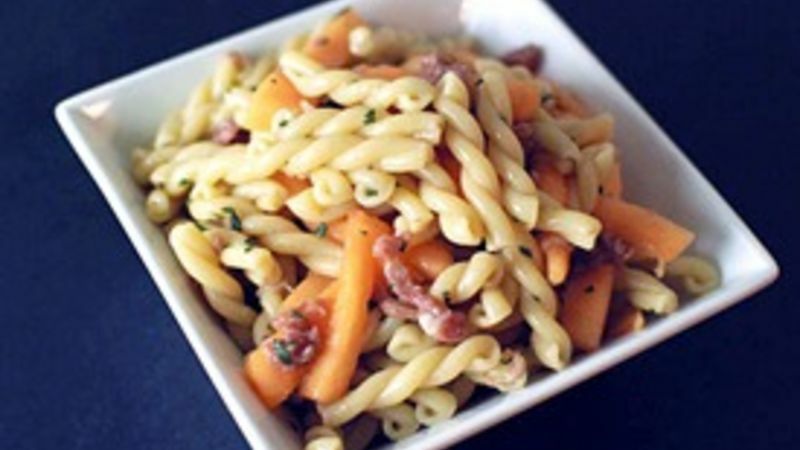 Cantaloupe and prosciutto is a classic Italian combo that works together perfectly in this pasta salad. Okay, sorry about the cheesy joke. But that’s seriously my all-time favorite fruit related joke! And believe me, I am somewhat of an expert on fruit humor. The way you cut this cantaloupe is very important. The idea here is to mimic the shape of the pasta. Tossed in some olive oil, red wine vinegar, and marjoram. Pasta and prosciutto join the party. Super fresh and summery. Salty from the prosciutto, sweet from the melon, and floral from the marjoram. Do you have a favorite fruit joke? Share below! Dan Whalen knows that time flies like an arrow, but fruit flies like a banana. He has been blogging for over 3 years at The Food in my Beard; check Dan's Tablespoon profile often to try his recipes with creative international spins!